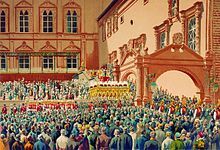 Reception o the Tsar of Roushie in the Moscow Kremlin. Tsar (Auld Kirk Slavonic: ц︢рь (uisually written thus wi a tilde) or цар, царь; an aa Czar or Tzar in Laitin alphabet leids) is a teetle uosed tae designate certain European Slavic monarchs or supreme rulers. This page wis last eeditit on 4 Julie 2018, at 19:00.